Rectangular Wooden Picnic Table, 12Ft. Wooden Planks with Welded 1 5/8 In. Galvanized Steel, Portable. Picnic Furniture offers high quality commercial wooden picnic tables available in rectangular, square, and ADA friendly styles. Our wooden picnic tables are crafted with Treated Southern Yellow Pine wood tops and wood seats with galvanized steel picnic table frames ensuring use for years to come. These commercial grade wooden picnic tables provide a natural look to state parks and public schools nationwide. Order online today or call our expert staff for any questions. At Picnic Furniture we offer economy choices to stay in your budget. Treated Pine is the choice for many local parks and National parks and schools. They are tough, attractive with a 1-year warranty provided. 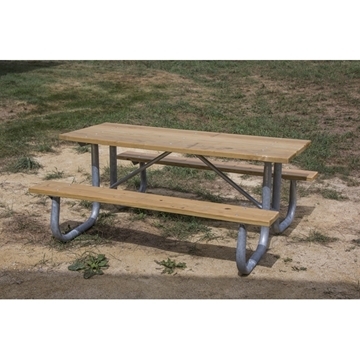 We offer Wooden Picnic Tables as a reliable economical choice for those with a specific budget. We can work with quantity discounts and cheaper freight costs to get you the best deal in your budget.